The Kirkland Tap& Trotter includes a 3% Kitchen Hospitality Fee on all checks to support a living wage for our hourly kitchen staff. Thank you for helping to support people that work incredibly hard at a very difficult craft. *Please note: To insure freshness, menu selections may change slightly day to day. Fresh Daily From The Farmer's Market! Subject To Change Based On Availability. YOU HAVE OUR PERMISSION TO EAT WITH YOUR HANDS! (v) Vegetarian-friendly; just ask your server. We know what it’s like to be parents and crave a really good meal, but there’s just no time! We’re making it easy for you at The Kirkland Tap & Trotter with our from scratch kids menu & our kids eat free special, every Sunday-Thursday from 5:30-6:30. 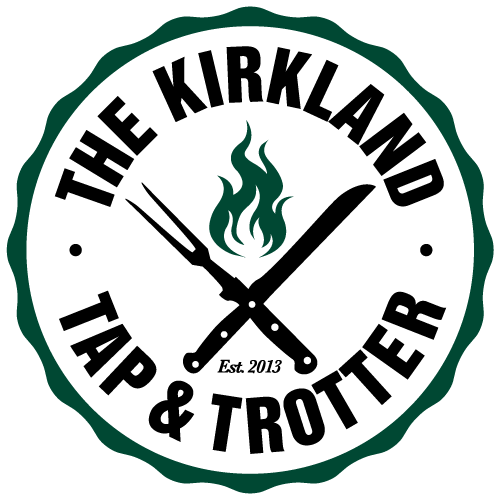 The Kirkland Tap & Trotter is the perfect neighborhood spot for drinks and bites before, during and after the game, a workout or a nap! And don’t forget, the bar is open all day! NOTE: Our bar is open all day.